Tomorrow I'll share our top three FAVORITE releases from Tiger Tales' fall line up and that post will include a giveaway. Despite the fact that the following titles were not listed as our top favorites (we had to be a bit choosy for the purposes of the giveaway!) we still liked all of the titles well enough to blog about them. We liked them well enough that they have been scattered to the furthest corners of the house for reading and I had to go about collecting them in order to write up these posts! I love Tiger Tales books - as the regulars around here now. They release new stacks of books in the Spring and Fall and we are always excited when the Tiger Tales book box lands on our porch. This time we ooh-ed and aww-ed over the entire stack! What was inside the box this go 'round? It's Holiday Time! 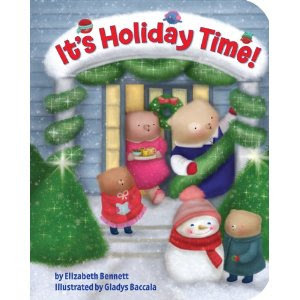 was the title I was most eager to see as it is written by Elizabeth Bennett, who was my former contact at Tiger Tales and went on to create her own children's book! I knew she was releasing a book and I was even more delighted when I discovered it has sparkles all over it! (Yes, my girly side takes over right quick when I see sparkles on a book!) The snowflakes, the gifts, the stars in the night sky all sparkle as a list of things that we all love best about the holidays are listed. Everything from loved ones dear to scarfs over noses are listed as being welcomed signs of this season. Very, very cute. The Fox in the Dark is an older title of Tiger Tales but which was just released in paperback. 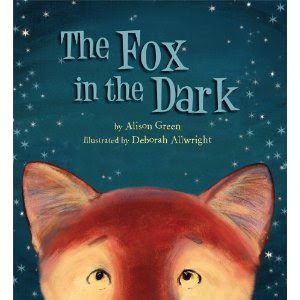 Both of my boys enjoyed this title by Alison Green. In this story rabbit is running home scared, being chased by a fox in the dark. He makes it safely in but various other animals keeping knocking on his door, seeking shelter from the fox. He lets them all and they hunker down for the night when the fox appears at the door, also seeking shelter. But from what? And what happens? Ah, you have to read it to find out. With All My Heart is a lovely concept. 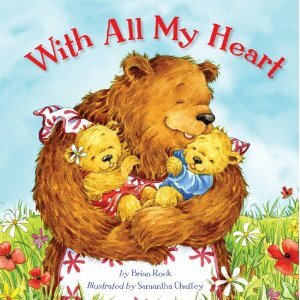 Brian Rock tells us the story of two little bear cubs who are both vying for their mother's attention. They want to know which one of them she might love best. The main message of the book is that she loves them both equally and with all her heart. I particularly liked this one, as an adoptive mother, because the different skills and traits of both bears were mentioned and valued. However in the end, although they were decidedly different with their own personalities, they were both loved. Great message! 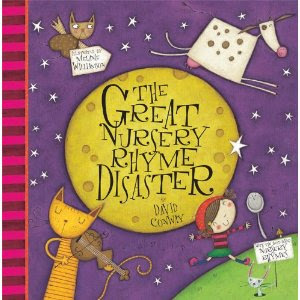 Lastly, for purposes of this post, there is The Great Nursery Rhyme Disaster which was also released in paperback this fall. This story, by David Conway, involves the nursery rhymes you know and love. Little Miss Muffet is a little bored with her own nursery rhyme and decides to check out life in another rhyme. She soon discovers that home - with her little spider - is the best place for her to be! 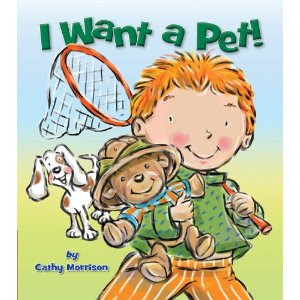 This is a very cute and imaginative tale and has been a requested re-read since it's arrival. The only reason it was not selected as our top favorite is because of the new title by Conway which I will tell you about tomorrow. Thank you, Tiger Tales, for sending copies of all of the above titles in exchange for our honest opinions which we have faithfully given. These all look like so much fun! I will be collecting children's books long after mine are grown, I know!